New gear in most every climbing category continues to push the limits, albeit in small increments. Although the Winter Outdoor trade show is known for skiing and winter apparel, we still found a handful of updates for rock, ice, and mixed climbing – which you can see below. X-Dream Alpine – CAMP took the previously available X-Dream tool and added an aggressive spike to the bottom of the handle as well as an adjustable pommel to satisfy the need of more versatile alpine climbers. The movable pommel takes just a few turns of a wire key allowing it to slide up and down the shaft. Video coming. Snaggletooth – A crampon with a horizontal monopoint. According to Black Diamond, this configuration is significantly more stable and versatile than a vertical monopoint. The concept was originally developed by a BD athlete who cut off one point on his Sabretooth crampons. How this prototype got into production is a much longer story… Video and full story here. Viper (updated) – The Viper continues to fill the mid-range alpine gap between the Venom technical axe and the Cobra tool. The update streamlines the hydroformed shaft for improved swinging and adds a movable pommel based on BD’s FlickLock trekking pole technology. Video coming. Twin Gates – Currently, there are 3 versions of Twin Gate carabiners available in the US (Mega, Lambda, Sigma). In the future there will be many, many more (Grivel whispers of 11+ versions, you can see the first 6 below). Grivel is certain these carabiners are superior to screw gate lockers in every way. Read more about the twin gates that are out now and see a video how they work. Tech Machine, Carbon – The first comments from US climbers reviewing the latest Tech Machine were, “Where’s the carbon version?” And here it is, at 560 grams (100 grams less than the non-carbon version). The carbon shaft is also indented (see G-Bone cross-sectional graphic below), adding strength and making it easier to grip. Video coming. North Machine, Carbon – A “G-Bone” carbon composite shaft increases rigidity and allows for an ergonomic grip throughout the entire length of the shaft. This alpine oriented tool weighs in at 550 grams. Video and full explanation of G-Bone coming. A&D Ascender (updated) – The release of the A&D ascenders last year made noise because of an integrated descender plate. Updates now include changes to the thumb catch opening mechanism. The enlarged catch looks like a bolt hanger and makes it easier to open for small hands and allows more options for unweighting the ascender. Here’s a video of the current A&D ascender. Video update coming. 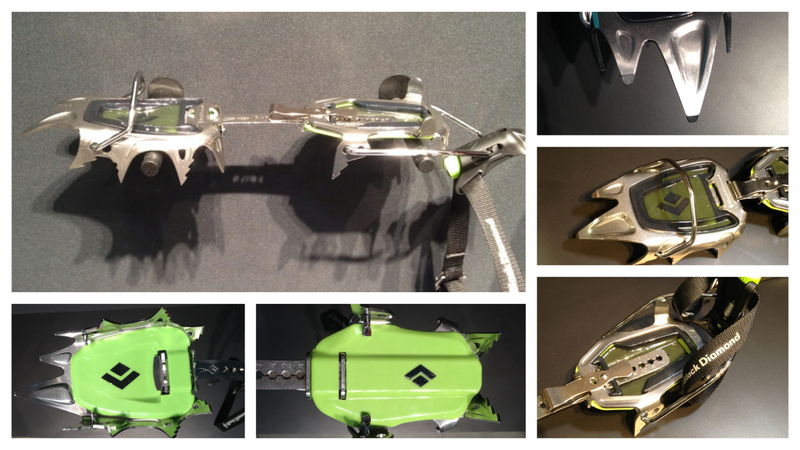 LifeGuard – Still in the prototype phase (as the pictures below suggest), but before 2015 is done, Mad Rock will release their own brake-assist belay device. Video coming. Pulse Shoe – Mad Rock has retired two of it’s lace-up shoes and replaced them with the Pulse. Instead of developing a men’s and women’s version, the Pulse is available in a “+” and “-” version. The “+” is for high volume feet and the “-” for low volume feet. We’re stoked on this attempt to kill the idea the gender dictates foot geometry. Video coming. FS Mini II – Coming in about a gram lighter, with a 1mm larger gate opening and a lower price, the FS Mini underwent a bunch of changes and seems to be better in every way. Video and story here. ULA Curve Nut (updated) – The new nuts now place even better with an asymmetric taper for increased stability in flaring cracks. This required the through-holes machined in the nuts to be modified, but the weight has stayed the same. Video coming. Ultralight Master Cams (updated) – Perhaps the largest update to the iconic Master Cams in history. They’ve lost 20% of their weight, mostly due to the removal of the thumb loop and swage. Perhaps more important to note is the addition of two new sizes: 7 and 8, debuting only $5 more than the smaller versions. Video and story here. Sitta – Petzl’s lightest harness to date (under 9 oz). They’ve replaced the “bulky” webbing used in most their harnesses and exchanged it with Dyneema threads that distribute the weight across the width of the waist belt and leg loops. Video and story here. Middle Marks – Sterling has gotten a lot of questions in the past wondering why they don’t add a middle mark. This was always answered with “Safety.” They’ve finally worked around their own concerns by creating a middle mark that will never wear away. It is dyed into the rope versus painted on. It’s even easy to see on their patterned ropes (shown below). Catalyst 9.0mm – A skinny rope coming in 70 or 80 meters that includes a middle mark and is double dry (core and sheath are treated) and includes Beal’s Unicore technology eliminating sheath slippage. The fall ratings are in the same range as many 10mm ropes. Video coming. First Draw – A quickdraw designed to be used on the first bolt, with a keylock React carabiner on top, and a steel wiregate carabiner on the bottom. The designated first draw extends the life of your other quickdraws as the first draw receives the highest wear due to the often sharp angle from the belay. Video coming. Gym Cuts – Trango takes their 9.9mm rope and offers it in two colors (Fuchsia and Blue) in both a 30m and 40m length to suit a gym climber no matter how tall the walls are. Phase carabiners, rack pack, and quickdraw (updated) – The Phase carabiner got a facelift: the spine used to have small grips along it’s entire length, and now the grips wrap around the spine but are only near the top of the carabiner where they have the biggest impact. The multicolor rack pack will be available in both a 6-pack and 8-pack. Video coming. If you want to check out (a lot) more climbing gear coming out in 2015, read our post from the Summer trade show. For those craving more Winter trade show news we recommend SplitterChoss’ Climbing Report that also includes apparel and mountaineering boots, the Gear Caster with information on Petzl’s personal anchor systems, and The Gear Co-Op showcasing the gear they saw on Day 1, Day 2 and Day 3. Didn’t see Sterling when I was there, middle marks finally!!!! Reckon a new Viper means a new Cobra some time next year? That was our guess too Joe! But when we asked they said they have no plans to update the Cobra because it’s still the best. It seems that the ‘don’t change it if it’s not broke’ theory lives strong on the Cobra’s.